Cathaoirleach Cllr Martin Baker lays a wreath outside City Hall. He is accompanied by Comdt Brendan McGovern. 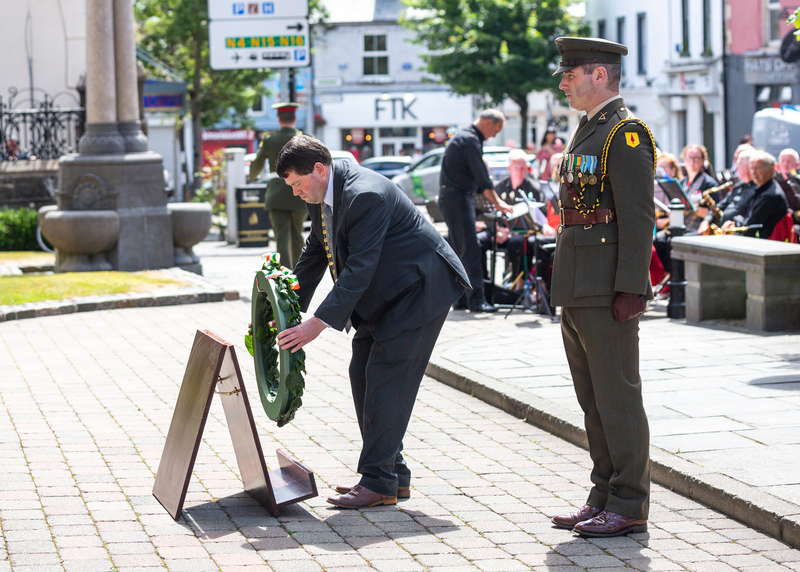 A National Day of Commemoration Ceremony, to honour all those Irishmen and Irishwomen who died in past wars or on service with the United Nations, was held on Sunday afternoon last at Sligo City Hall. The ceremony included an ecumenical service by representatives of Sligo’s Christian Churches, the laying of a wreath by Cathaoirleach of Sligo County Council Martin Martin Baker, observance of a minute’s silence and raising of the National Flag. Music was provided by Sligo Concert Band and Olivia O’Hanlon accompanied by Donal Gray. Representing the Defence Forces were Parade Commander Captain Barry Dolan, Comdt Brendan McGovern and NCO in charge of Honour Guard Sgt John Coyle. In attendance for the clergy were Dean Arfon Williams, Fr Pat Lombard, Reverend Jeremy Nicoll and Reverend David Clarke. Guests included community representatives as well as next-of-kin of those who died in past wars or on UN service, a wide cross-section of the community including ex-servicemen’s organisations. Cathaoirleach Martin Baker thanked the many people who attended the ceremony, and said it was a fitting tribute to those brave men and women who lost their lives in past wars.